Interwetten is a German bookmaker that has been around for a long time. They were founded in 1990 and started taking the online market in 1997 and are growing ever since. They have excellent reputations and are available in 10 languages and in many different countries. They are growing and always come up with something new, and now they are growing esports betting at Interwetten as well. The bookmaker is also a quite active sponsor of many different sports teams. They took over sponsorship of football teams, motorsports teams, and other sports fields. They are really passionate about their business and sports in general. They are also giving their best to offer the best experience for esports betting. That includes attractive bonus offers and other interesting promotions. We tested the bookmaker for you and provided all the info you need for the best way to start esports betting at Interwetten. Interwetten is just starting to offer esports betting, and therefore they are focusing on the most popular games. They provide esports bets for League of Legends, Dota 2, Starcraft 2, Overwatch and of course they also offer CSGO bets. They focus mainly on the popular leagues and tournaments but they offer a lot of options to bet on esports, and they are increasing them continuously. Esports betting at Interwetten comes with a lot of different betting types to make it even more interesting. You can place map bets of all of the games. That means you bet on the winner of a specific map or a combination of maps. You can also place bets on specific performance and actions happening on the maps. For CS:GO betting you also have the option to bet on the total amount of rounds. You can also place Handicap bets on the Counter-Strike matches. Esports betting at Interwetten sure is diverse with all those options. While betting on a LoL or CS:GO tournament or any other esports match it is exciting to decide on your bet based on the actions the team takes. That is precisely what live betting does, you bet on a match while it is actually happening. Interwetten offers that option, and you can do live betting for many famous esports events. 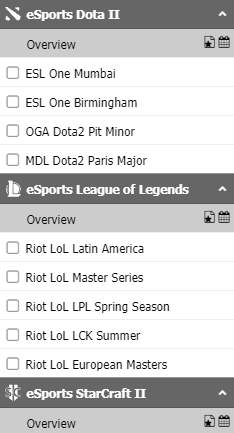 That will spice up your LoL betting and the way you watch your esports tournaments. Interwetten is a big bookmaker that offers a lot of different sports to bet on apart from esports. One of their main focus is football, but they also offer bets for Basketball, Tennis, Golf, Boxing, Motorsports, Darts and many other sports. You can also bet on entertainment and social events. And they offer a big selection of casino games as well. So, if you want to vary your esports betting, you can decide to play some slots, card games or join the live casino. One thing is certain: Interwetten does not get boring. Interwetten offers pretty decent odds for esports betting. Although they mainly focus on other sports their esports betting odds are very attractive, and they do their best to improve them continually. Especially for the CSGO bets and bigger tournaments they offer great odds, and you will enjoy them for your esports betting at Interwetten. Interwetten offers a generous welcome bonus for their new customers. You can get a 100% up to 150 Euro bonus on your first deposit. That means you will have double your deposit for esports betting at Interwetten. The bonus is available for their whole betting section and not exclusively for esports. But they might have special esports bonus offers at one point. You can even use the welcome bonus in the online casino. The bonus funds have to be turned over at least 5 times, and the odds for the bets counting to the turnover have to be at least at 1.70. The conditions might vary a bit depending on how you choose to use your bonus funds. Depositing and withdrawing money at Interwetten is easy. You have a lot of different payment options to choose from. You can use credit cards, Paysafecard, and bank transfers. You can also use e-wallets like Skrill, Ecopayz or Neteller for your transactions. They even have their own Interwetten Vouchers you can use for payments. There are many other options you can use, and for most of them, they do not apply any fees. For sure you will find the best method for esports betting at Interwetten.